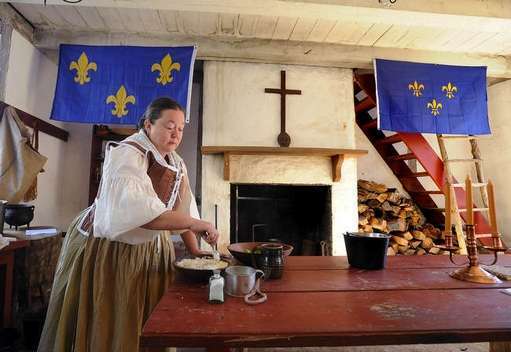 The Historic Foodie, sometimes known as Victoria (Rumble) Brady, has written several books and a host of magazine articles about the joys of food and cooking in earlier times. She collects antique cookware from the U.S. and Europe and her interests include heirloom gardening, food preservation and preparation as well as all aspects of 18th century material culture. When she noticed as many people were buying her books as a guide to a self-sustainable lifestyle as for their strictly historic content she began to tailor her lectures to include their needs and share her knowledge with those who don’t want to be wholly dependent on modern technology. In these uncertain economic times more and more people want to learn the skills of former years in order to provide for themselves and their families and Victoria’s books are a handy comprehensive guide for doing just that. Books may be purchased from thistledewbooks@yahoo.com. See thistledewbooks on Facebook. The Historic Foodie has traveled throughout the U.S., Scotland and Ireland demonstrating open hearth cooking techniques, signing books, and meeting lots of people who share her passion for food and cooking. She has appeared on live television, both local and national venues, such as WGN Chicago, preparing foods and/or discussing the origins of foods and the virtues of healthy home-cooked meals. The news staff at WGN finished off her period soup and even wiped the pot clean with a crust of bread! Her articles have appeared in such illustrious magazines as Early American Life. 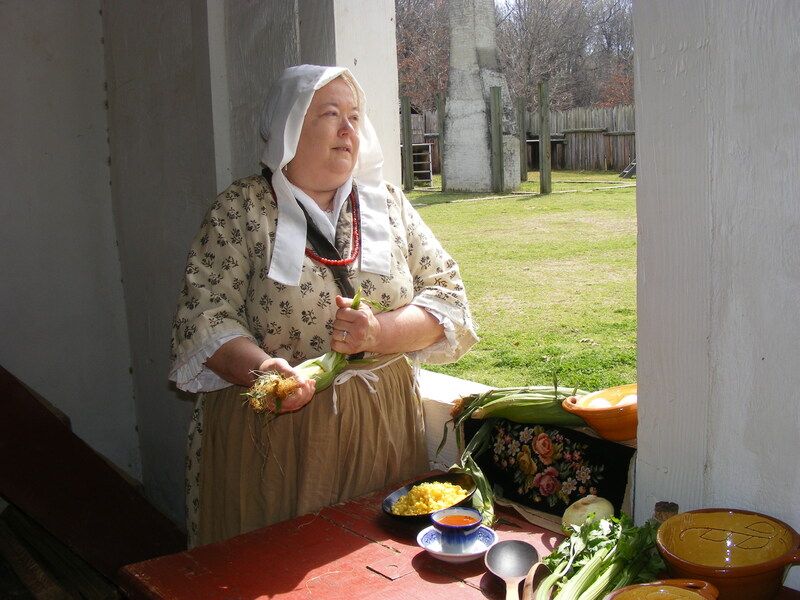 She has lectured at numerous living history museums, national parks, historical conferences, heirloom farmer’s markets, the Champlain Valley Exposition, Gettysburg Meets the Arts, home school associations, civic organizations, historical and genealogical societies, etc. etc. Martin Brady, a retired Marine, has been involved in historical interpretation for over 30 years, having set up demonstrations and programs for scouts, rendezvous, and for the public, sometimes in some pretty odd locations such as Okinawa, Japan. After he retired from the Marine Corps, he owned and operated a store in Pennsylvania called Brady’s Faithful Reproductions prior to moving South. They discovered when two historians combine households their reference book collection takes on a life of its own! Victoria has been a member of the Daughters of the American Revolution for some 30 years and Martin is a member of the Sons of the American Revolution. He participates as time permits with the SAR color guard. Both Martin and Victoria have spent over 30 years researching historic clothing and honing their talents as seamstress and tailor. Victoria has made period correct garments for docents at various museums, as well as garments for herself and friends. 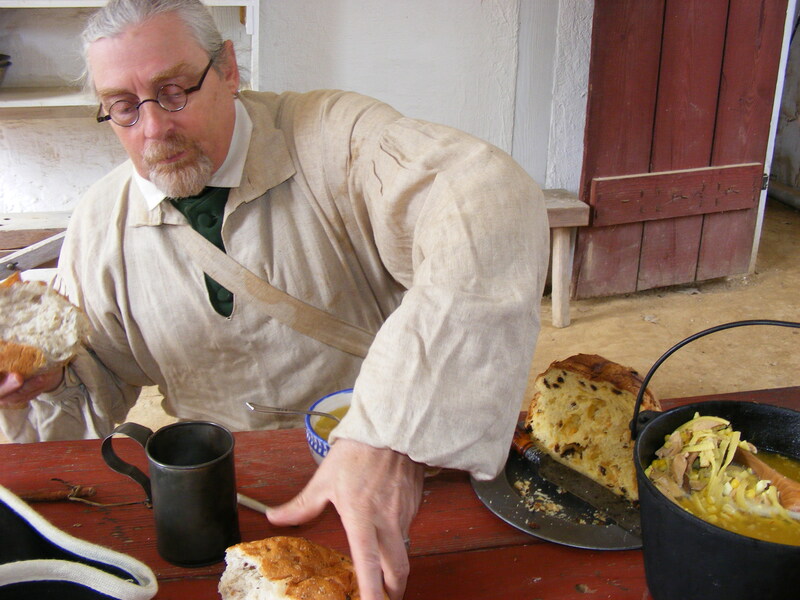 Martin makes moccasins and shoe packs, men’s, ladies, and children’s 18th century garments, and is equally talented at whipping up period meals. He made Victoria’s wedding gown which is an exact copy of a 1750’s gown worn for a wedding in Scotland. Victoria and Martin live in the Appalachian foothills and are in the final stages of updating a home and developing the property into a sustainable mini-farm. She would like the place to resemble the one she grew up on in South Central Tennessee. Improving the property is a never-ending journey that will see them through, and past, retirement, rehabbing an old barn, rebuilding fences, thinning out trees, adding garden plots and fruit trees, etc., and they have plans to build an 18th century style cabin on the property from which they can immerse themselves fully in a less stressful but sustainable way of life. They share the place with a slowly growing number of farm animals (Orpington and Ameracauna chickens, bourbon red turkeys, Pekin and Rouen ducks, Chinese geese, Pearl and Jumbo French guineas, pheasants, Muscovies, rabbits, etc.) and a Beagle named Patches who keeps them all on their toes. Future acquisitions may include sheep and pigs. 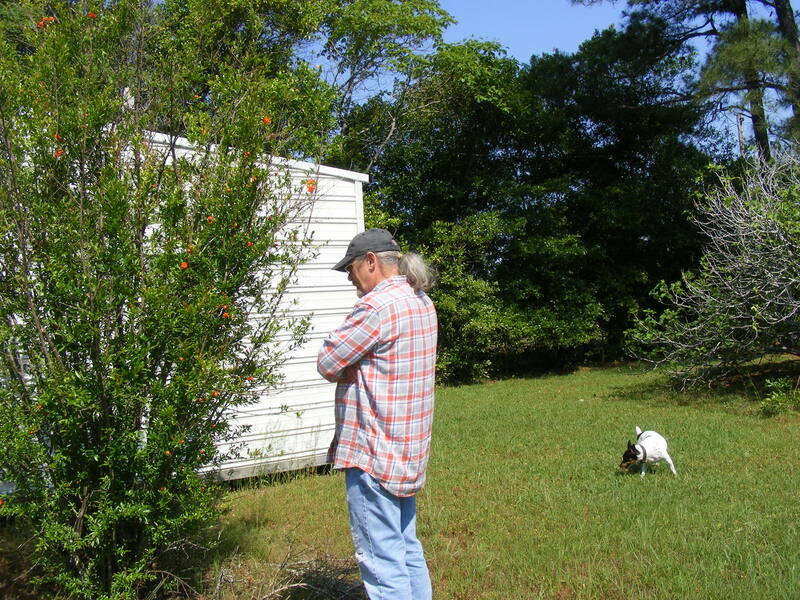 Martin having a look at pomegranate blooms. They plan to grow more heirloom vegetables, grain, and herbs which find their way into Victoria’s meals and cooking demonstrations, and they constantly research a wide variety of historic and self-sufficiency topics much of which turns up in articles at thehistoricfoodie.wordpress.com. They figure as long as they work together there is no task they can’t finish successfully! They can be reached at thistledewbooks @ yahoo.com. [type all together]. 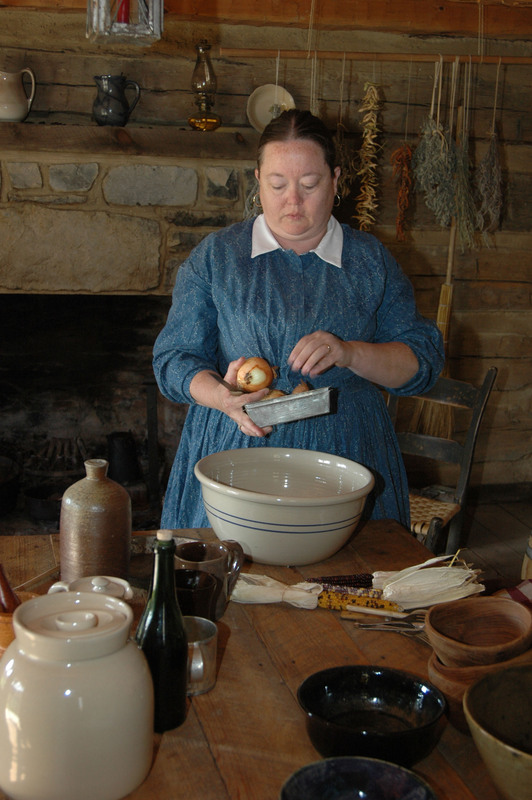 TheHistoricFoodie training museum volunteers in period food preparation at Tipton-Haynes State Historical site. 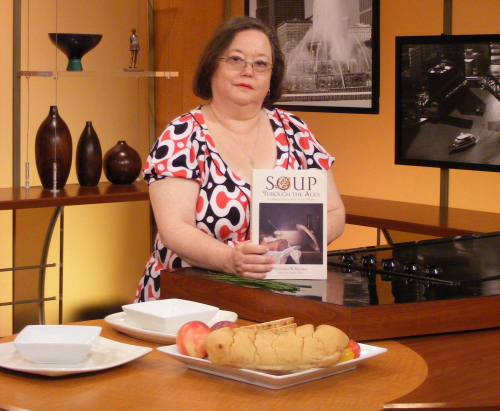 On the set at WGN Chicago just before a live cooking segment, Aug. 2010. Feel welcome to subscribe to TheHistoricFoodie blog and join the fun! I’m writing on behalf of MIT Press. We think that you and your readers will be interested in our newest podcast inspired by the latest issue of The New England Quarterly. The podcast is an interview we’ve recorded between Rebecca Federman of the New York Public Library and the Cooked Books blog and Paul Freedman, author of Out of the East and Food: The History of Taste. In the interview, Freedman discusses 19th-century American restaurant dining as it is explored in his article “American Restaurants and Cuisine in the Mid–Nineteenth Century”. The interview covers such topics as the most popular dishes of the time and which dishes could possibly make a modern-day comeback. We hope you and your readers will enjoy it! We also think, given that your blog features some very delicious-looking recipes, your readers would be interested in any of the three historic recipes that we have posted on the podcast page; in particular, the recipe for Apple Fritters seems like it might be an excellent fit for your readership. We suggest that you try making the dish yourself and including it in a post with a link to our podcast page. If you choose to do this, we will tweet your post to our 13,000 twitter followers and 12,000 Facebook fans. We’re very excited to have both the interview and the historic recipes up on our site and we hope you enjoy them! Please click the link below to see the podcast webpage and to listen to the podcast, and please let me know if you have any questions. as there is a free minute. I’ll post photos and discuss further with you after I do my post. What a great find your blog is! Thank you, I will visit yours as well. You might enjoy http://18thccuisine.blogspot.com/ as well. A fellow foodie with fabulous material and knowledge. Thank you so much for sharing with us!